Farmers in western Liberia, specifically in Grand Cape Mount County have abandoned their farming activities due to fear of dozens of wild animals including elephants and bush cows’aggression against them if any attempt is made to go to their farms. According to our correspondent in western Liberia, these wild animals have resolved to attack any farmer who will be spotted as they carryout routine from one farm to another. The elephants in their aggression have killed a 43-year old man, identified as Simeon Henry on Monday of this week while making a journey to a nearby town. according to the report, this incident comes after several attacks from bush cows and elephants in communities in both Porkpa and Gola Konneh districts. Grand Cape Mount Superintendent has since confirmed constant invasion of towns and villages by the elephants, while launching an appeal to the Forestry Development Authority and other relevant government institutions to swiftly intervene. Superintendent Vincent has warned if nothing is done to address the situation, more lives would be lost as farming activities have been paralyzed since the attacks from elephants. 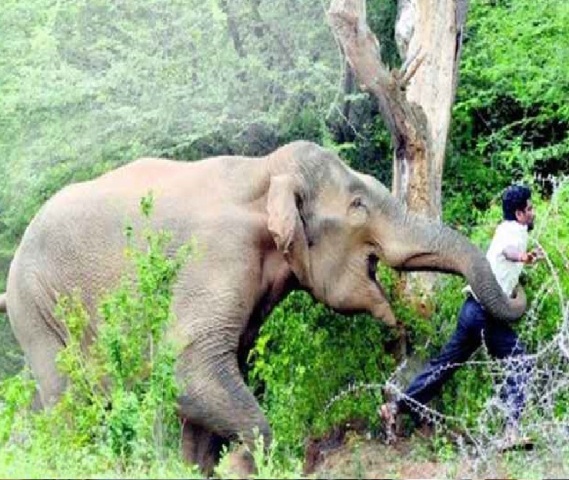 According to him, the elephant attacks started since August of this year destroying farms and threatening lives. “I am so worried for my people because most of them depend on farming activities for their survival, now with elephant attacks, farm activities can no longer go on, he lamented”. Superintendent Vincent named some of the affected by the elephant attacks as Benduma, Buttery Hill, Bombom Junction School Campus in Porkpa, Varguay and now Jersey town in Gola Konneh District.